"One thing I know for sure," warns Bloomberg's Richard Breslow, "everyone has a plan and no one has a clue." The conundrum can be summarized as why you both have to pay close attention to what policy makers say, and take it all with a grain of salt. Uncertainty about the direction of the economy, where we stand from past and future policy mistakes and no ability to predict how markets will ultimately re-price keeps price action very much afoot. And lest anyone tell you otherwise, the only thing you might reasonably predict from election outcomes is the most immediate reaction. History tells us that what happens after the fact never fits the pat scenarios. Reality and events always best the best storylines. These periods of intensified market debate allow us to get a real sense of investors’ most repressed position fears. And what central bankers worry could be the possible, horrifying, and never-to-be-admitted, unintended consequences of years of market distorting, yet oh-so theoretically appealing, policy measures. The most difficult issue for everyone to negotiate is the flatness of all curves. The inexorable pushing out of duration, with little regard for adequate compensation, has put everyone into a dangerous situation. And from this stems all other distortions. Lack of steepness, so central to policy motivation, has become the problem in and of itself.Yet no one can bear to admit the cost of reversing the trend. Is it any wonder that any speculation of tapering throws everyone into hyper-analysis? Or why every measure of tightening talk is mixed with three measures of lower for longer. 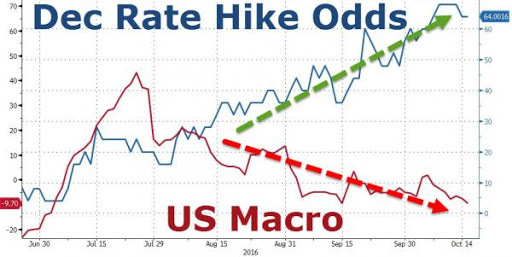 Chair Yellen said nothing earth shattering last Friday, but the reaction to it speaks volumes. As Bloomberg's Mark Cudmore notes, her tentative communication approach won’t inspire economic confidence and is yet another example of the Fed fumbling policy execution. Yellen’s speech on Friday pondered the idea of leaving the economy to run “hot” in the hope that it might repair some of the damage caused by the 2008 financial crisis. The concept is far from profound and would arguably be standard economic doctrine. Unfortunately, her presentation style eroded much of the benefits of such a policy. Most market participants have always assumed the Fed would ultimately be forced to take such an approach. That’s why the market never prices in all the hikes the Fed policy makers project. In fact, that misplaced Fed hawkishness -- a wildly optimistic dotplot -- is directly to blame for some of the economic headwinds of recent years. Now it seems the Fed wants to rectify its previous mistake and make clear to the market that dovishness is the watchword. Except that Yellen bungled the communication. She should have come out confidently declaring what the plan is and why. It’s not like she has an excuse for being unprepared or not having thought through the details and consequences – it’s her full-time job. Instead, she seemed to float the idea as if she herself questioned its validity. What was needed was a bold message of dovishness: “The economy is strong. We’re not going to tread on it. In fact, we’re going to let it roar. Get involved.” That would have motivated economic agents to focus on investing, spending and expanding. 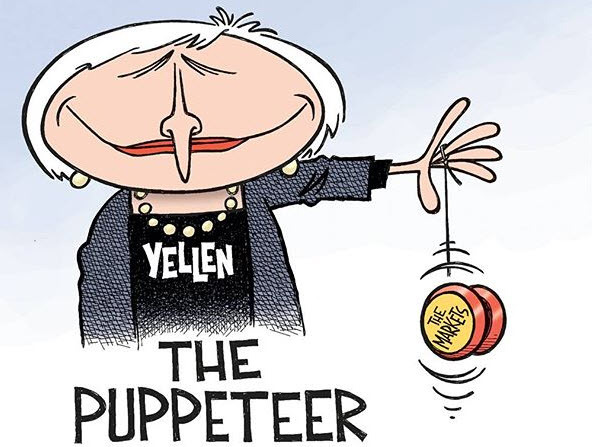 Instead she has compounded the Fed’s previous hawkish error by leaving the impression that it really isn’t sure how to support the economy, and that it has so little conviction in its policy plans that they could be reversed quickly (again). Failure has been rescued from the jaws of success. An opportunity to provide a major sentiment boost has been spurned in favor of continuing confusion. Sadly, investors must persist in keeping at least one nervous eye fully focused on an unpredictable and incoherent Fed. It’s the real economy that misses out. As Breslow concludes, how do you very slowly steepen duration, of all kinds, without raining down brimstone on everyone who has done what they have been officially forced to do? 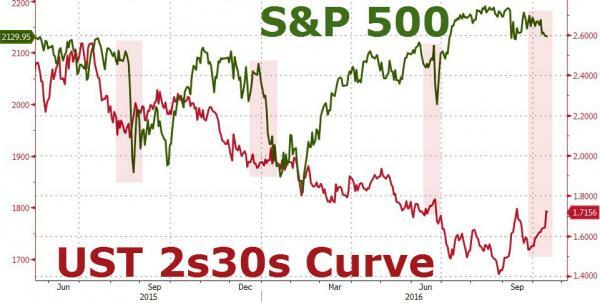 Equities have done nothing wrong so far. They are just lower in their bigger range. The dollar is just acting more rationally. What you need to monitor is how gently and slowly, yet consistently, long rates can be maneuvered higher. They remain at crisis levels, just for perspective.